The problem of high school dropouts is becoming more urgent as the formulas for calculating dropout rates are being changed and communities discover that a problem previously described as minor is actually reaching crisis proportions. How do we begin to address the dropout problem? What solutions are available? What can communities do to help their young people stay in school and get a diploma? Our dropout discussion guide can help answer these questions and more. This is an invaluable resource for individuals looking to promote civic change in their own communities. Inventing Civic Solutions contains the results from eight different civic problems ranging from accessible transportation to rural leadership development to thriving business districts. Written by a practitioner and a university research partner, these successful initiatives are described in detail from the perspective of the particular challenge that was posed, its proposed solution, how its success was evaluated, and reasonable expectations for replication. Based on the results of more than a decade of research by the Pew Partnership for Civic Change, Smart Communities provides directions for strategic decision-making and outlines the key strategies used by thousands of leaders who have worked to create successful communities. 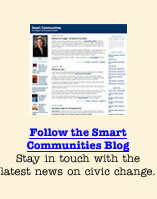 Smart Communities offers leaders from both the public and private sectors the tools they need to create a better future for all the community's citizens. Smart Communities offers hope to those who are striving to make significant inroads to their communities and addresses vital issues such as poverty, race relations, and offering a good start to all children. New Eyes on Community is an eleven-year retrospective of the work of the Pew Partnership for Civic Change. Joining with hundreds of community partners the Pew Partnership has built a wealth of knowledge and experience about the kinds of programs and processes that will change communities for the better. This booklet tells the story of the evolution of the organization's thinking and programs. New Directions in Civic Engagement has four thematic elements representing the most pressing questions surrounding university and community partnerships. Each of those elements are available here in a separate PDF. A fifth PDF includes the publication's introduction, lessons, and endnotes. Section titles and their related chapters are listed below. Click on a section title to download the PDF of that section. The Pew Partnership is pleased to make available this July 2003 report on higher education & community research partnerships. The publication summarizes the findings from a nineteen-site participatory research initiative that partnered community-based organizations with academics from area colleges and universities. It also highlights the conversation and general themes that arose during a roundtable discussion with representatives from higher education, the philanthropic sector, and the nonprofit community. What Makes a Solution? 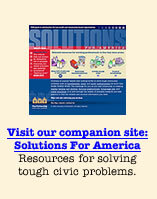 Lessons and Findings from Solutions for America. What does a homelessness prevention program in Los Angeles share with a rural infant mortality program and a job training program for women in construction? This report from August 2003 highlights research findings from nineteen Wanted: Solutions for America sites and identifies common features of effective community-based programs. It also describes the participatory evaluation model that partnered faculty and program staff in the research process. This guide translates complex evaluation research into actionable strategies needed to build stronger communities. What We Know Works is a primer that summarizes current research in four broad areas: healthy families and children, thriving neighborhoods, living-wage jobs, and viable economies. These are issues of paramount concern to citizens and of critical importance to the future of all communities. This resource provides a road map through the array of social service programs and a starting point to address discrete issues—from quality childcare to homelessness to downtown revitalization. What’s Already Out There is a compendium of community-based programs that are effectively addressing urgent national issues. The programs profiled in this volume are the result of a research project called Wanted: Solutions for America that set out to document existing solutions to some of the nation’s toughest problems. This report is organized around five major issue areas: Programs that Help Young People Stay in School, Off Drugs, and On Track; Programs that Create Viable Local Economies; Programs that Equip Families for Success; Programs that Begin with Neighbors; and Programs that Create Collaborative Change. Each section offers the nuts and bolts of successful programs in that issue area.